The original Game of Thrones? “This is the original Game of Thrones,” or so says the man who would know, George R.R. Martin, and The Iron King certainly has more than its share of murder, adultery, conspiracy, star-crossed lovers and bloody-minded cruelty. The only thing it doesn’t have is dragons (unless you count the ones on heraldic devices). It’s an account of the last days of the Capetian dynasty of France, when the feudal society of the Middle Ages was giving way to the modern state, and England and France became locked in the deadly embrace of the Hundred Years’ War. 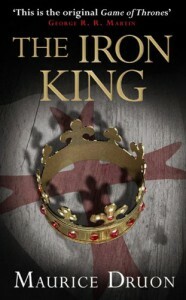 The Iron King opens a generation before the war, in 1314, when Philip the Fair successfully concludes his persecution and destruction of the Knights Templar, one of the most powerful organizations in Europe. On his pyre, its last Grandmaster, Jacques de Molay, curses the Capetians unto the 13th generation. (And, within a year, all three architects of the Templars’ fall would be dead. Coincidence? Well…yes. The curse is the stuff of urban legend; and does it really make sense that a man brutally tortured for seven years and being burned alive would have the presence of mind to enunciate a curse against his tormentors? But it does make for a good story.) Between the death of de Molay and Philip, the royal family is torn apart by adultery. The wives of the king’s three sons are implicated in affairs. Two are condemned to convents, and the third is put under house arrest (she hadn’t had a lover but she helped the others conceal the trysts), and the hapless lovers are tortured and brutally executed. Meanwhile, the king’s daughter, wife of Edward II of England, is taking advantage of the situation to put herself and her young son (future Edward III and instigator of the Hundred Years’ War) in a position to claim the crown of France. I would love to recommend the book wholeheartedly but I cannot. The translation is not very good. It reads like a school exercise. Something I’d expect from a student in a (admittedly advanced) French class. It competently translates the French, I’m sure, but that’s all it does – there’s no life in it. Times like this I wish my grad-school French was up to reading the original. Nevertheless, I’m interested enough in the story – and the translation does on occasion rise to the level of excellence the story deserves – that I’ll persevere through the 2nd book – The Strangled Queen – at the very least. * As an aside: One of my favorite books about the period (the 14th century) and one I’d eagerly recommend is Barbara Tuchman’s A Distant Mirror. If a bit dated, it brings the period to life by following the life and career of one of France’s premier – if now obscure – nobles, Enguerrand de Coucy, who dies a prisoner of the Turks in 1396 (if I recall correctly).